Here is yet another recent Barbie that I found in the discounted toys isle of a local supermarket. Unlike the big smiles of my other B-Girls this one has a 'Lea' face with a more restrained yet gorgeous smile. In her box her face reminded me a bit of a poster of the 'Black Swan' movie so I named her Nina after the main character in 'Black Swan'. 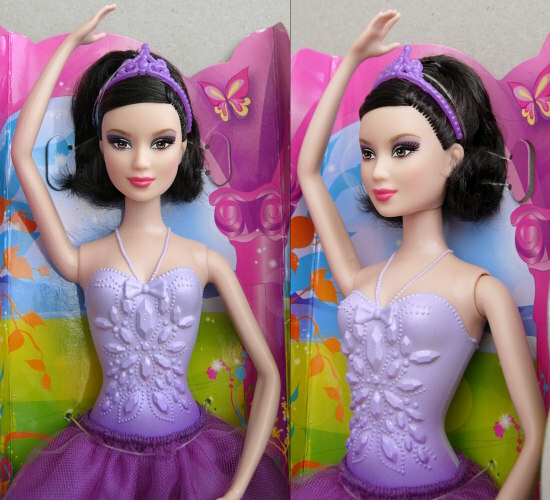 Actually compared to the catalog picture, the eyes of this particular batch of Ballerina Barbies are a bit bigger than what is usual for Lea faces, I wonder if this was done on purpose to create a likeness to the 'Black Swan' character. Apart from the slightly oversized eyes, this head sculpt has a realistic shape and beautiful features. Like most recent Barbie heads, this one also is slightly larger, but it does look great on a CG v2 body. I left her hairdo with high pony tail unchanged as it emphasizes the beauty of her face. There is a tiny spec of black paint on her right cheek, it shows up on some pics. I'll leave the spec there because it is in the middle of the rouge blushed area so when I remove the spec the rouge probably gets damaged as well. As with the others this Barbie doll also came with a basic body with rigid arms and legs (not even bendable knees) so I carefully removed her lovely head to put on an articulated body. She has a rather pale skintone so I had a choice of a TTL body and an 'enhanced' CG v2 body. By daylight the TTL skintone appeared to be the best match but on test pictures I took the CG body looked even better, so no squeaky TTL joints and funny elbows but a properly articulated CG body for this little dancer. I slightly modified the neck of the CG v2 body. After that I used a piece of vinyl tubing to adapt the neck post to the wider neck hole of the Barbie head. At first I put her in a black top (from a ZC Girl Roseanna), Yamato blue jeans and some old yet elegant DT feet-with-shoes. The Yamato jeans are restricting her poses a bit but I couldn't think of anything else for her to wear. I had to firm up the ankles of the DT feet (vinyl feet with hard plastic pegs, the pegs fitted rather wobbly in the feet, making her gradually lose her balance. I managed to catch her in time everytime without dropping my camera, phew !!). This time I used some, less conspicuous, clear vinyl tubing to put over the ankle pegs rather than gray UTP cable sleeve. Despite the heat (33'C/90'F in the room when I took the pics) I think she looks a different kind of hot . Later I swapped her jeans for some black FemBasix leggings, allowing her to strike a greater range of poses.